calcitriol (active form of vitamin D), which is needed for the absorption and utilization of calcium and phosphorus. Kidney failure occurs when a dog’s kidneys are no longer able to remove the waste and concentrate urine. If your dog is developing kidney disease you may notice he or she needs to drink and urinate more often. This is their instinctive attempt to keep the body free of waste – a job the kidneys once did easily. This cycle of over drinking and over urinating will work for a while, but eventually, no amount of water will be enough to get rid of the toxins building up in your dogs system. Chronic kidney disease (CKD) is a progressive condition involving long-term damage to the kidneys that can occur over a few months or over several years, resulting in an irreversible decrease in kidney function. Early diagnose of CKD is essential since it is both permanent and progressive. The very best diet for dogs with kidney problems is one that is formulated for that individual dog. It is important to take the age of the dog, activity level and any other health issues into consideration for a fully individualized approach. A home-made diet provides flexibility in that the diet can be tweaked to take blood test results into account so as to find the ideal diet to manage the condition long term. That sort of dietary flexibility is not possible with a commercially produced dog food. When your dog’s kidneys need some help, the main goal is to lower the amount of phosphorus in the diet. The degree of phosphorus restriction depends on how advanced the kidney disease is. A healthy dog requires 100mg of phosphorus per kg of body weights to the power of 0.75 per day. For very early-stage kidney disease I start by using 70-80% of that number and will reduce further as creatinine levels increase. Creatinine is an important and easily measured indicator of renal health. For comparison purposes, most regular commercial diets have around 1.5% phosphorus on a dry matter (DM) basis. A dog with early stage kidney disease should be limited to around 0.5% phosphorus on a dry matter basis. These numbers must be reduced further for dogs with moderate stage kidney disease. Dogs with advanced, late-stage kidney disease need even lower phosphorus: around 0.3% DM daily. Initially, protein restriction may not be required but can be helpful down the track. The best indication of a need to reduce dietary protein is when concentrations or urea and other nitrogenous substances in the blood show up on test results. At this point the disease has progressed, and most dogs are showing symptoms such as vomiting, nausea, loss of appetite and lethargy. Dogs with kidney problems should always have access to water, even if it causes accidents in the house. Tap water may be very high in minerals and is best avoided so switch to bottled water instead. 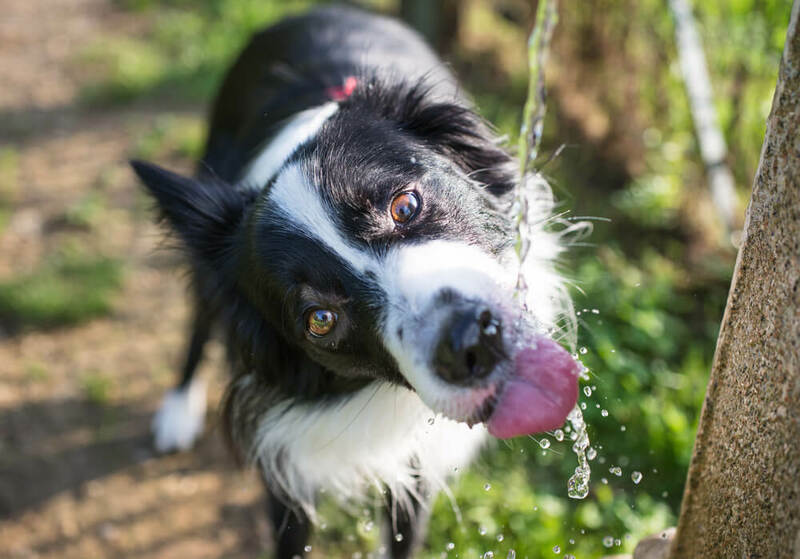 It is important that your dog stay hydrated, as dehydration is very harmful to the kidneys. Adding water to the food, particularly if you feed dry food, may also help with this. Most other dietary restrictions depend on your individual dog. Dogs with kidney disease often also have hypertension (high blood pressure), thus they need a reduced-sodium diet. If your dog’s potassium levels are too low, and increase in dietary potassium may be required. The most important supplement to give to dogs with kidney disease is fish body oil (not cod liver oil). The omega-3 fatty acids in fish oil have been found to slow progression of kidney disease. Do stay away from vegetable oils as these may worsen renal damage. Vitamin E works as an antioxidant to promote overall health. It is excellent for dogs with renal issues and recommended whenever you supplement oils (such as fish body oil). The B-Complex vitamin group is also a prudent supplement because they are water soluble meaning they are easily flushed from the body by dogs with kidney disease, due to their increased drinking and urinating. Supplementing B-Complex will ensure your dog has enough as these vitamins support almost every cell and body tissue. CoQ10 can be beneficial to kidneys and works as a very powerful antioxidant. Taurine may also be beneficial. Why is My Dog Refusing Food?